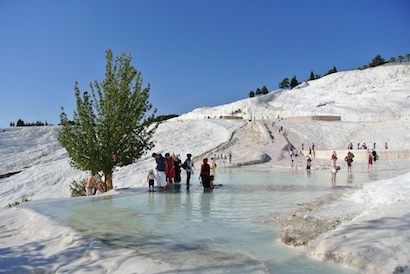 Pamukkale Denizli information, guides, maps, pictures, videos & thermal hotels. Pamukkale is located to the south central of the Aegean region of Turkey. At the northern banks of Pamukkale there is the Hierapolis Ancient City. Almost all transport to and from Pamukkale is via the city of Denizli which has a large and active bus terminal, train station and airport. Everything you need to know about visiting Turkey's most popular attraction.